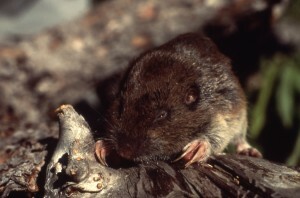 Yates and Pedersen (1982) list seven North American species of moles. 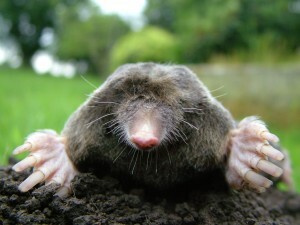 They are the eastern mole (Scalopus aquaticus), hairy-tailed mole (Parascalops breweri), star-nosed mole (Condylura cristata), broad-footed mole (Scapanus latimanus), Townsend’s mole (Scapanus townsendii), coast mole (Scapanus orarius), and shrew mole (Neurotrichus gibbsii). Pocket gophers are fossorial (burrowing) rodents, so named because they have fur-lined pouches outside of the mouth, one on each side of the face. These pockets, which are capable of being turned inside out,are used for carrying food. Pocket gophers are powerfully built in the forequarters and have a short neck; the head is fairly small and flattened. The forepaws are large-clawed and the lips close behind their large incisors, all marvelous adaptations to their underground existence. Gophers have small external ears and small eyes. As sight and sound are severely limited, gophers are highly dependent on the sense of touch. The vibrissae (whiskers) on their face are very sensitive to touch and assist pocket gophers while traveling about in their dark tunnels. The tail is sparsely haired and also serves as asensory mechanism guiding gophers’ backward movements. The tail is also important in thermo-regulation, acting as a radiator. Pocket gophers are medium-sized rodents ranging from about 5 to nearly 14 inches (13 to 36 cm) long (head and body). Adult males are larger than adult females. Their fur is very fine, soft, and highly variable in color. Colors range from nearly black to pale brown to almost white. The great variability in size and color of pocket gophers is attributed to their low dispersal rate and thus limited gene flow, resulting in adaptation to local conditions. Thirty-four species of pocket gophers, represented by five genera, occupy the western hemisphere. In the United States there are 13 species and three genera. The major features differentiating these genera are the size of their forefeet, claws, and front surfaces of their chisel-like incisors.